One of our goals at the Estuary Program is to engage students in learning about the bay, its wildlife, and the challenges that face it. The more they understand and appreciate the estuary, the more likely they are to help keep it healthy and clean. We often go into classrooms, host students in our Nature Center, and take small groups of students on field trips around the bay. This July, we were privileged to work with students in a new capacity, by participating as clients in Cal Poly’s Upward Bound Summer Academy. 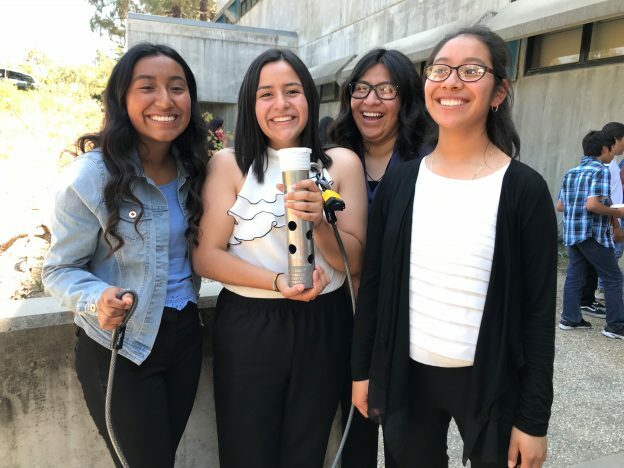 This program combines classes in math and science throughout the school year with a six-week summer residency at Cal Poly. During the residency, students took on projects from different local nonprofits. Estuary Program Communications Outreach Coordinator, Rachel, leads a hands-on demonstration that shows students how pollution from the surrounding lands can run into the bay when it rains. Photograph courtesy of Delphinus School of Natural History. At the Estuary Program, we were lucky enough to work with three groups of students on two very different projects. Staff presented the projects to the students at the beginning of the month, and then made ourselves available to answer questions. The students and their instructors took it from there, learning about the estuary and environmental science while they worked on real-world projects. The results were very impressive. 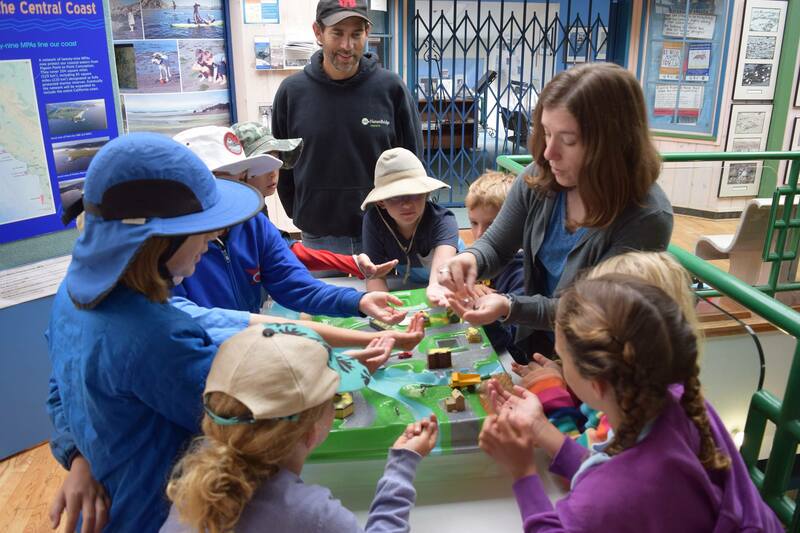 The marine debris project asked students to create an exhibit for our Morro Bay Estuary Nature Center that would address the issue of trash in the estuary and the ocean. 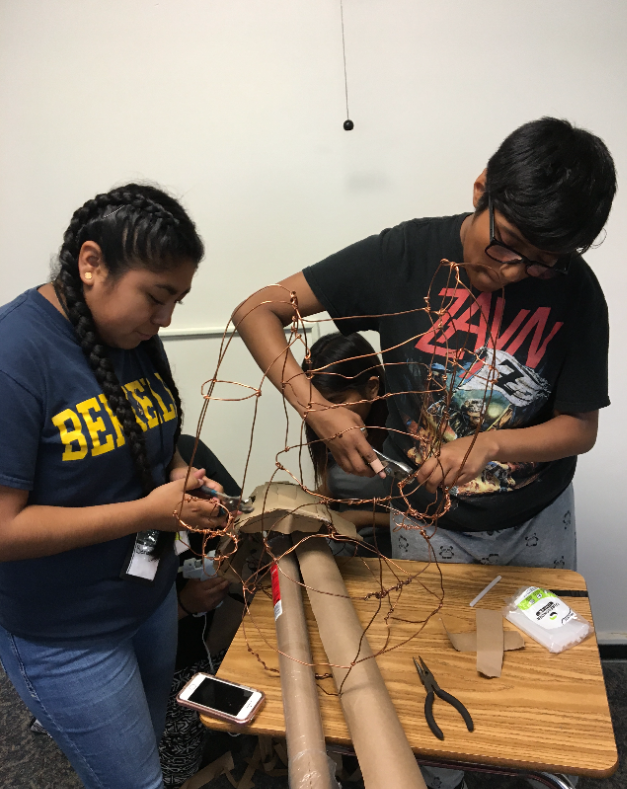 We asked that students combine service with art and science by creating a sculpture from trash collected within the Morro Bay watershed. They also wrote an artist’s statement and drafted text that explained the dangers of marine debris to the health of wildlife and waterways. At the students’ final project presentation at Cal Poly, our staff was amazed at what the students had created. 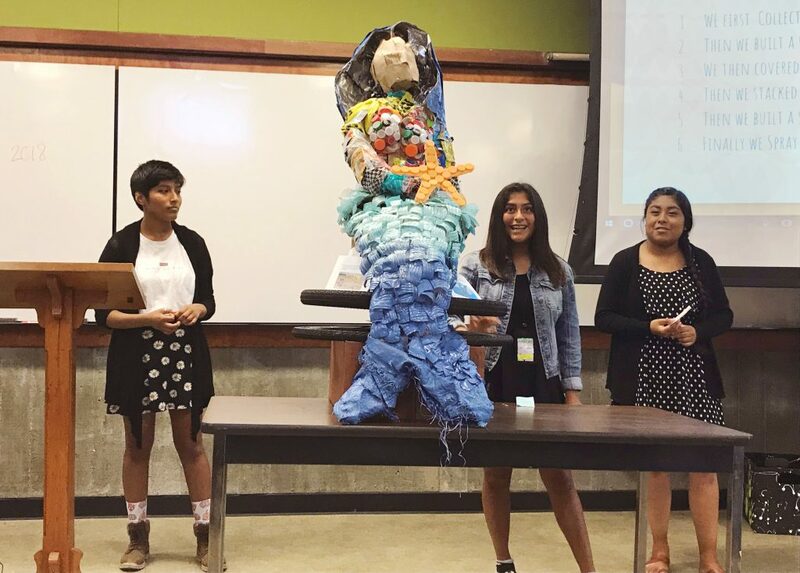 From five bags of trash collected along the Morro Bay Embarcadero and around their dorms on the Cal Poly campus, they created a mermaid. 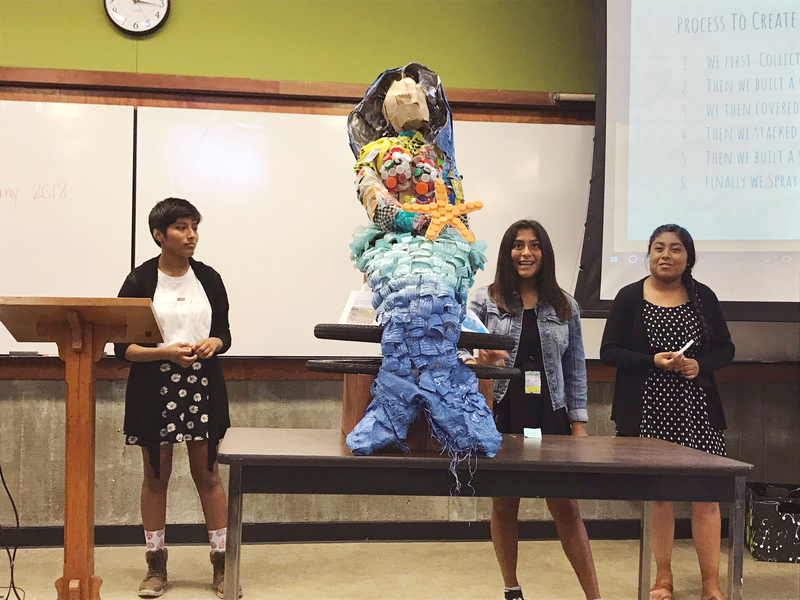 The students who created the mermaid sculpture presented their artwork to the crowd and explained its symbolism as well as the importance of reducing the amount of debris that enters the ocean. The students created a wire frame in the shape of the mermaid. and then fastened the marine debris to the frame to create the final sculpture. The students explained that the mermaid is symbolic. “Humans and the ocean have been presented as two separate worlds and, in a way, they are,” they said. However, “mermaids are of both worlds and are proof that peace can exist” between them. By helping people connect with the ocean, we can take something as harmful as the problem of marine debris and find a beautiful solution. The mermaid will be installed in the Morro Bay Estuary Nature Center soon; we hope you’ll come and visit her in person! Our second project was highly technical. 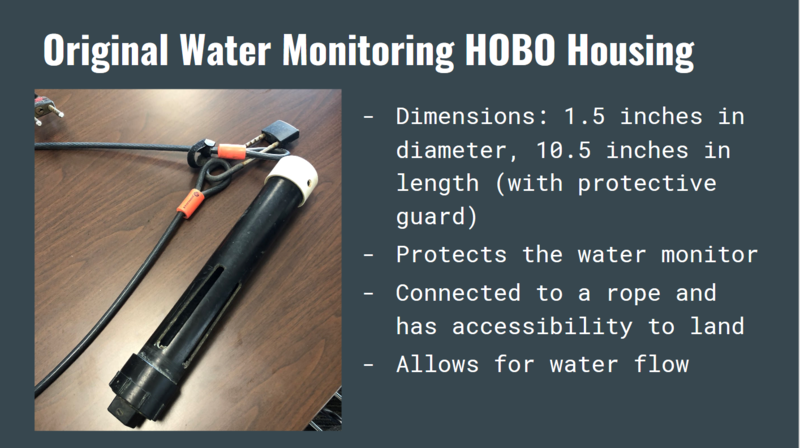 It asked students to create a new housing for a piece of water quality monitoring equipment called a HOBO. The housing needed to fit the monitor well, be easy to open and to clean, and have the ability to stay submerged without floating away. The students took detailed notes about the water quality monitoring equipment during their trip to the Estuary Program office to meet with staff. They used this information to build their prototypes. The image above shows some of the observations made by one of the two groups of students who worked on this project. 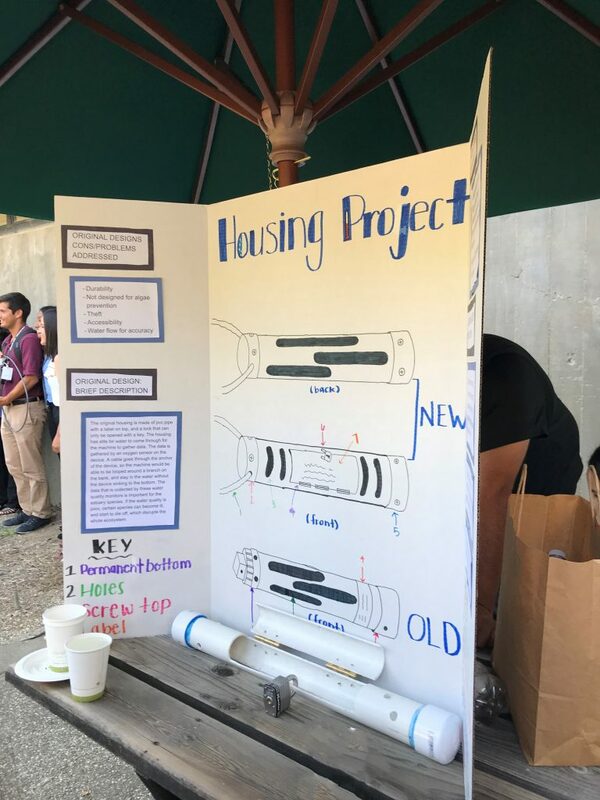 Two groups of students tackled this project, and both groups came up with carefully-considered prototype concepts that exceeded our expectations. This water quality monitor housing project poster explains the elements of one group’s design. It sits on a table where presentation attendees can take a closer look during the celebratory reception. The design above solved the problem of the old housing’s sticky caps by adding permanent caps and an easy-to-open hinged door for monitor access. Though the prototype was made from PVC piping due to budget constraints, the group suggested producing the final product in copper, which discourages algae growth. 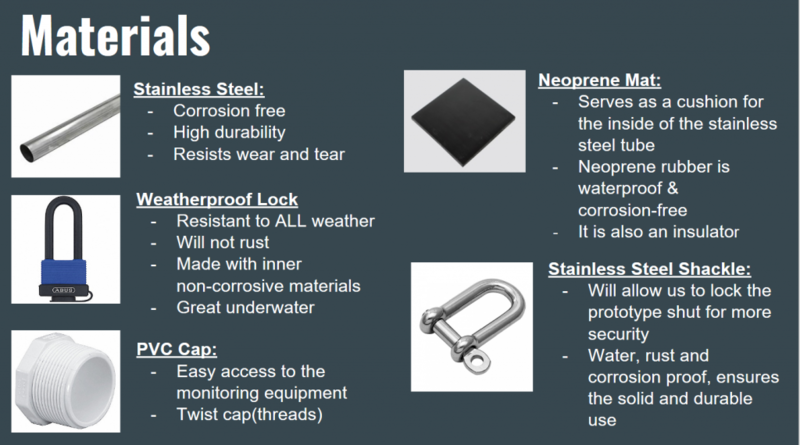 They also included a lock that resists corrosion and a heavy cable to secure the device in place. This design included a durable stainless steel body, weatherproof lock, and neoprene to cushion the monitor inside the housing. They used heavy machinery to cut holes in the steel so that water could flow in and out of the monitor. They also learned to use a sandblaster and used it to etch the Estuary Program’s contact information onto the housing permanently. This image from the group’s presentation shows the new materials chosen for their design and explains the benefits of each one. Students pose with their finished prototype during the post-presentation reception. Many of the students who worked on the monitor housing project plan to major in engineering and related fields in college. Help us protect and restore the Morro Bay estuary! Donate to the Estuary Program today and support our work in the field, the lab, and beyond. The Estuary Program is a 501(c)3 nonprofit. We depend on funding from grants and generous donors to continue our work. Support us by purchasing estuary-themed gear from ESTERO. This locally owned and operated company donates 20% of proceeds from its Estuary clothing line and 100% of Estuary decal proceeds to the Estuary Program. Thank you, ESTERO! Purchase items from the the Estuary Program’s store on Zazzle. Zazzle prints and ships your items, and the Estuary Program receives 10% of the proceeds. Choose from mugs, hats, t-shirts, and even fanny packs (they’re back!) with our fun Estuary Octopus design, our classic Estuary Program logo, or our Mutts for the Bay logo.